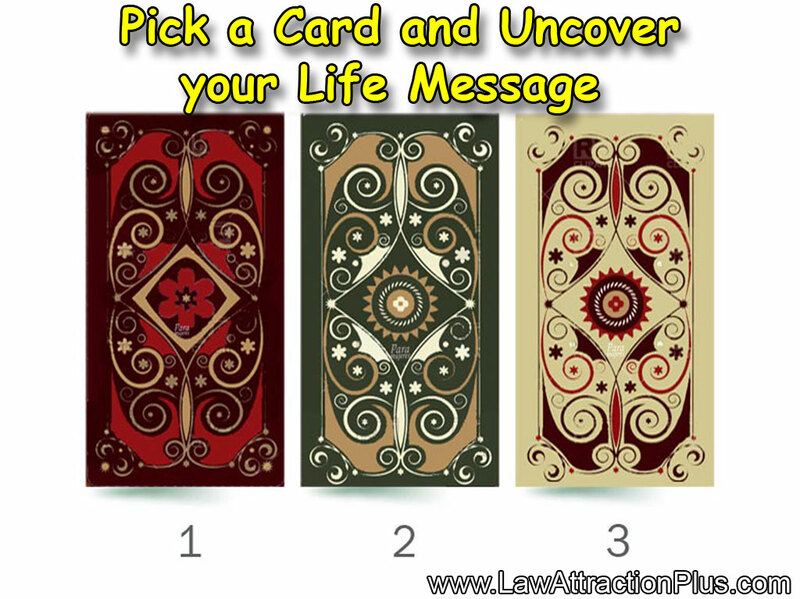 Pick a Card and Uncover your Life Message | Law of Attraction Plus: The Secret revealed! Look at the three cards and let your intuition choose its favorite one. Please don't pick a card randomly, hear that voice inside that guides you to choose the one which identifies you. Then discover your life message! Fortitude and happiness is your true nature. And even if sometimes you run into situations that spiral out of control and test your faith, your optimism and you will to move forward, it’s important to remember your light essence, that magic place within you, where anything you wish to be and do is possible. Life is full of ups and downs, but what matters is that what you learn stays with you forever. Strength and happiness is your nature, you have the power to make every day the best day of your life, so look at the sky and declare with love that you enjoy the present, while radiating love to everything good that is yet to come. Your true nature is love, the strongest force in the Universe. Most of the time the road ahead seems lengthy and you may wonder why, after traveling so far, you haven’t reached the goal you long for. The most important thing is to remember how strong your willpower is, that you work for with love for the ones you love, and if you seed, harvest time will come for you. This card comes to your life today to teach you how to trust. Keep going, good things may take some time to arrive, but they always do. Commit to your goals and dreams, life always favors the dreamers. Use your hope and strength to fly higher every day. Kindness and generosity is your true nature. You’ve given so much and done so much for others, because your heart sincerely tells you to help. You know a single act of kindness can enlighten someone’s life, and this card comes to your life today to let you know it’s time to enlighten your own life. The Universe is governed by rules of balance. You’ve given so much and now it’s time to get your heavenly reward that is waiting for you. Everything that is good will come to your life but only if you allow it. If you want love, prosperity and happiness to arrive to your life, you must feel worthy of them, so today open your arms, be thankful for all that you have received and for all the blessings to come.